FILE - The name of the Spanish right-wing party Vox is sprayed over the graffiti stencil reading "Independence" on sidewalk in Barcelona, Spain, Dec. 12, 2018. Spanish far-right party Vox has signed up three former generals to run for parliament in next month's general election, two of whom expressed support for the legacy of former right-wing dictator Francisco Franco by signing a petition last year. The inclusion of openly pro-Franco candidates with senior military backgrounds underscores the ground that Vox has broken in a country that had largely shied away from far-right, militaristic politics since Franco's rule ended with his death in 1975. Rosety and Asarta signed a manifesto last year in support of Franco's legacy, including the military uprising that ignited the 1936-39 Spanish civil war and resulted in his rule until 1975. 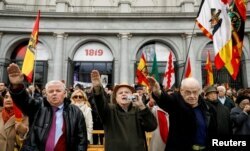 FILE - Supporters of Spain's late dictator Francisco Franco give fascist salutes during a gathering commemorating the anniversary of Franco's death at Madrid's Plaza de Oriente, Spain, Nov. 18, 2018. The manifesto, which was has been signed by about 600 former members of the armed forces, was issued as a response to the Socialist government's plans to remove Franco's remains from a state mausoleum outside Madrid, according to the promoters. The mausoleum has long been seen by critics as a monument to fascism. Latest opinion polls show support for Vox, which opposes gender equality laws and immigration and has a strong stance against independence for Spain's regions, as high as 12.1 percent. That could translate into 38 seats in the national parliament at the April 28 election. The Franco mausoleum at the Valley of the Fallen has long been a source of controversy. The Socialist government said last Friday that the dictator's body would be removed on June 10 and reburied in the family tomb at a state cemetery outside Madrid.